4:46b where he made the water wine. 4:46c And there was a certain Royal Official whose son was ill in Capernaum. 4:47c because he was about to die. 4:48 Therefore Jesus said to him ... except you see signs and omens you never believe. 4:49 The Royal official says to him ... Lord, come down before my child dies. 4:50a Jesus says to him ... Go, the son of-you lives. 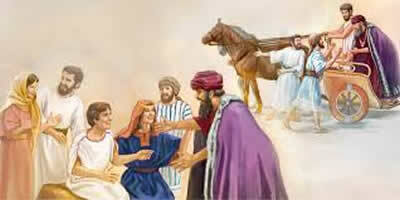 4:50b The man believed "the word" Jesus said to him. 4:51b saying that his child lives. 4:52a Therefore he asked the time from them in which he became better. 4:52b Then they said to him that ... Yesterday, seventh hour, the fever left him. 4:53a Therefore "the father knew" that it was "the same hour" in which Jesus said to him ... "The son of-you lives." 4:53b And he believed, and all of his house. 4:54 And this again, a second sign, Jesus did ... having come from Judea into Galilee.